Towards the end of our visit to Singapore, we had a little time to kill before we had to board the metro for the airport. So what to do? The National Gallery had a twenty (Singapore) dollar admission and we don’t have that much time, so it seemed a poor investment. Me being me, I dragged us, our luggage in tow, to the possible location of a bookstore with a possible English language section. 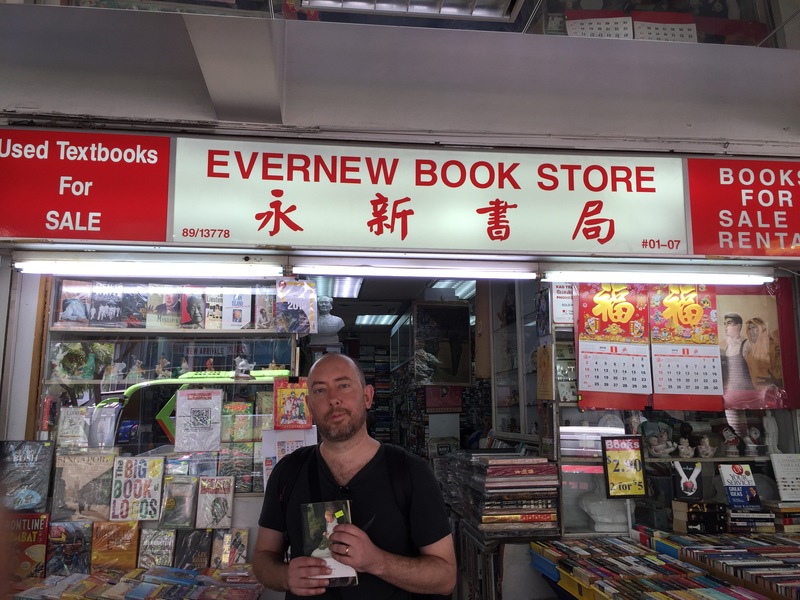 Finally, after rounding the corner from the post office (we wanted to send off some postcards), I found Evernew Bookstore, a used bookstore in a little shopping center. I didn’t get very far beyond a stretch of shelves (with only a very narrow space for human beings) that was filled with the orange spines of Penguin classics. And what did I find but a book that I’ve been wanting to read that is not in the DC Public Library system and which is never available at your local bookstore: Goethe’s Elective Affinities. If you’ve ever seen the great Truffaut film, Jules et Jim, you might remember there is a reference to it. When Jim visits Jules and Catherine in their wooded Austrian retreat, he asks to borrow the book, which is a signal that he intends to do a little wife swapping (not really swapping, though; Jim isn’t married; so not so much swapping as just sleeping with his friend’s wife; it’s complicated). ← Midweek Staff Meeting – I Saw That!